Whether we’re abroad or in our own city of Bakersfield, Ryan and I love to sip drinks and eat snacks while taking in a view. I received an email this morning from Fodor’s with a link to an article about the 10 best hotel bars with a view in Europe. It’s great timing because we’ll be visiting three of the cities this fall! In Lisbon, the article recommends the BA Terrace at the Bairro Alto Hotel. This was already on my radar after reading about it in a Trip Advisor forum post. Since our Lisbon itinerary is fairly relaxed (we plan to do a lot of exploring in the different neighborhoods), there will hopefully be time for us to visit this bar and enjoy the fantastic view! The Roof at the ME Madrid Reina Victoria also made the list. I haven’t run into it (yet) while researching, but tapas and drinks with a view? Sounds perfect! The Trafalgar London has the Vista rooftop bar. Given the fact that access to Vista is subject to seasonality and weather conditions, we may not make it during our almost-winter trip. But, if we do, a couple of their specialty drinks sound delicious! Plus it’s fairly close to our hotel, so, with nice weather, this would be a great place to relax and take in the view. Other cities with hotel bars that made Fodor’s list include: Berlin, Florence, Moscow, Munich, Oslo, Paris, and Prague. 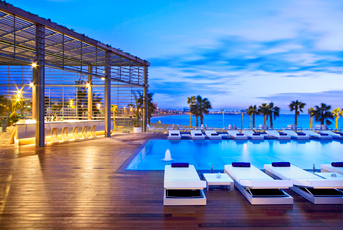 Some additional bars with a view that we will definitely take advantage of on our next trip are in Barcelona at our very own hotel: The W Barcelona. Although the W wasn’t included in the Fodor’s article, there are several bars at the hotel (which is located on the beach), including the Eclipse bar with a stellar view and the WET bar with poolside access. Before finishing this post, I wanted to include a fun fact: Ryan was planning on proposing to me at a rooftop bar in Venice! It didn’t end up happening that way (there was a special event going on), but it would have been a beautiful view! 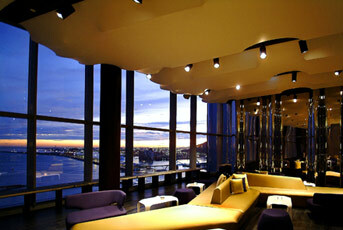 The Skyline bar at the Hilton Molina Stucky Venice will be on our list of places to visit next time we’re in Venice. This entry was posted in Food, Travel and tagged Barcelona, bars, Europe, Lisbon, London, Madrid, Spain, UK, Venice by Kristin. Bookmark the permalink.